Johnny Walker – Content, Fit and Alcohol-Free! Johnny Walker, in his 80s, reflecting on happy times at Molineux. Picture courtesy of Bryan Horsnell (Reading FC historian). It needed something special to keep Johnny Walker out of Wolves’ team early in their glory years. And, unfortunately for him, ‘very special’ would be an apt description of the competition for places that he faced. The Scottish-born inside-forward was restricted to only 44 games for the club but the fact that he scored 26 goals underlines both what a good player he was and the counter claims of those around him. “I was surrounded by England internationals,” he said. “I would love to have played a lot more for Wolves but I was squeezed out by some very good players. 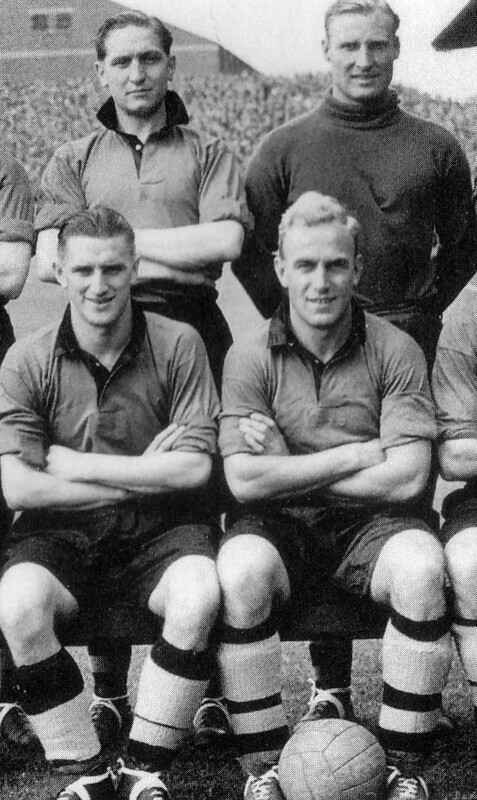 “Bert Williams, Billy Wright, Johnny Hancocks, Jesse Pye, Dennis Wilshaw and Jimmy Mullen were all around in 1949-50 when Stan Cullis first picked me. “Then Peter Broadbent was signed and Norman Deeley, Ron Flowers and Bill Slater broke through over the next year or two. What a collection of talent that is! “It’s no wonder Wolves did as well as they did and who is to say that Roy Swinbourne wouldn’t have got into the England side as well if he had stayed fit? 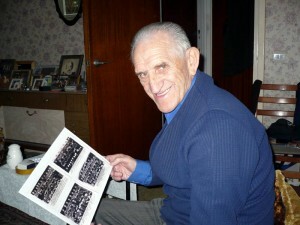 Walker, signed in 1947 after impressing Ted Vizard’s scout George Noakes while playing for Glasgow club Campsie Black Watch, was one of the unlucky ones in as much as he emerged just too late to figure in the triumphant 1949 FA Cup final run and left before the first of the club’s three title conquests of the 1950s. But his love for Molineux is undimmed. He still regularly attends reunions there, including a fund-raising dinner for the family of the stricken Broadbent – the man who did more than most to weaken his hold on a first-team place. “I can pick up a phone today to ask for tickets at Wolves and I could be there on Saturday,” he added. “They treat the former players very well. “It’s not the same at my last League club, Reading, where I also did some part-time coaching for many years. I have a season ticket there because I live nearby but it has to be paid for. Walker (front left) in exalted 1950s company with, going anti-clockwise, Billy Wright, Bert Williams and Ray Chatham. “I had only been to England once before joining Wolves and that was for my national service at Cirencester. It took me a couple of years to get into the side, then I was the top scorer with five goals in the Cup run when we reached the last four in 1950-51. “I also scored in the semi-final but, unfortunately, we lost 2-1 in a replay against Newcastle at Huddersfield. With 48 goals in 172 games for the Saints, Walker continued to give excellent value and, having then been promised two years at Reading, ended up staying at Elm Park for seven and a half. He made 319 appearances for them before retiring in 1965 and has been named much more recently among the club’s top 100 players of all time. After his football days, he spent eight years with the Post Office and has also done factory and delivery jobs. “I’m 82 next month and as fit as a fiddle,” he said. “I don’t smoke and said just before Southampton beat Manchester United in the 1976 FA Cup final that I wouldn’t drink again. Posted on: Thursday, November 25th, 2010.